New restaurant marketing and food trends are still emerging even though we are getting close in on the midway point of the year. 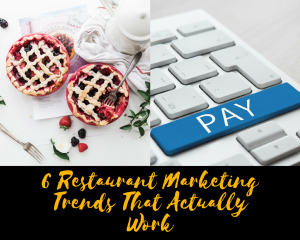 These trends can have a huge impact on restaurants in all shapes and sizes especially small independent restaurants. Online ordering is getting better than dine-in with a whopping 300% growth and its helping boost restaurants’ bottom lines: Higher ticket averages with a 15% or more increase in an average check; increased customer frequency, from 2 visits per month to 3. According to PizzaMarketPlace.com, pizza shop is a huge industry, generating $40 billion in the US alone. We all know that we love pizza, and an astonishing 17% of all restaurants in the US are pizza places! So if you are thinking about opening a pizza place or including pizza in your menu, it is a good strategy. When you consider that 50% of the consumers have downloaded a certain restaurant application, creating one for your restaurant is possible and it can give you a great deal when you allow online ordering. Professional chefs and the majority of diners consider hyper-local food as a restaurant trend that does not age, rather, it improves over the course of time. Hyper-local food includes locally sourced meats and seafood, locally grown produce and environmental sustainability. Hyper-local restaurant couriers are springing up left and right to meet the demands of hyper-local food. Connection with local farmers is already there so they can get food to you as fast and as fresh they could. And because food travels in short distances in smaller trucks, you are helping in cutting down carbon emissions. Win-win! These trends are relatively still very useful nowadays. The internet is a highly recommended tool for all kinds of promotion may it be within your area or if you’re looking to advertise globally. This entry was posted in Restaurant Marketing and tagged marketing your restaurant, Restaurant Marketing, restaurant marketing advice, social media marketing for restaurants. Bookmark the permalink.